To promote authentic art, culture through music and dance among the South Asian diaspora, the Sajda Festival of South Asian Performing Arts launches at the Band on the Wall with a stunning celebration of the work of the late, great Indian singer, Manna Dey. Sajda, meaning to bow down with reverence, aims to provide a platform for South Asian music, performance, literature and other art forms. The first Sajda event is a centenary celebration of the legendary Indian singer Manna Dey, featuring performances from Dr. Rajat Banerjee and Vaibhavi Deshpande. These revered UK-based vocalists will perform solo and as a duet, paying rich tribute to the iconic voice of Indian music and film, Manna Dey. 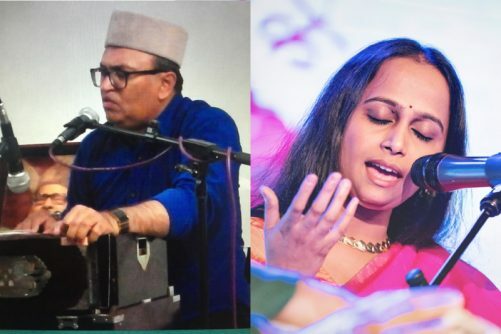 Accompanied on tabla and dholak by the veteran Sandeep Popatker and one of the leading keyboard players Mukesh Kannan, the group will sing popular songs from the worlds of Bollywood and semi-classical musics, plus other compositions. Dr. Rajat Banerjee is has been a disciple of R Nandy from Kolkatta for tabla, and has also been a close accompanist as well as a student of Manna Dey. He has performed in UK and internationally, singing Manna Dey songs in Hindi and Bengali for over two decades, gaining a huge following via his live concerts and popular YouTube channel. A classically trained vocalist known for singing popular Bollywood songs, Vaibhavi Deshpande is a former student of Pt Raghunandan Panshikar. She has been a finalist of India’s famous reality show Sa Re Gama Pa, and has lent her voice as a playback singer to several Marathi TV serials. This event is seated show. Charity Partner: International Association for Human Values. A Nineteen Forty Seven Presentation. Sajda Festival is coordinated and organised by Rahul Laud (Asian Lite).